Travel in the shadows and fine lines with this modern and rare CAPRI Indoor/Outdoor Stone garden Patio dining table 55"x55". Named after the beautiful island known from its breathtaking scenery and majestic rocks, CAPRI is ideal for those looking for a fresh and unique product. Sturdy and neat this tiled marble mosaic stone table is a safe bet it will fit perfectly into your environment. Accommodating up to 10 persons max (with its corners), CAPRI will remind you of the atmosphere of southern Italy. Appreciating the finesse of marble (stone), hand-made and magnificent as well as the intrinsic quality of the product! The CAPRI table will be a long term satisfactory product, along with a very strong plate with the warranty you will never see your product fade in the sun. (Sold without chairs). 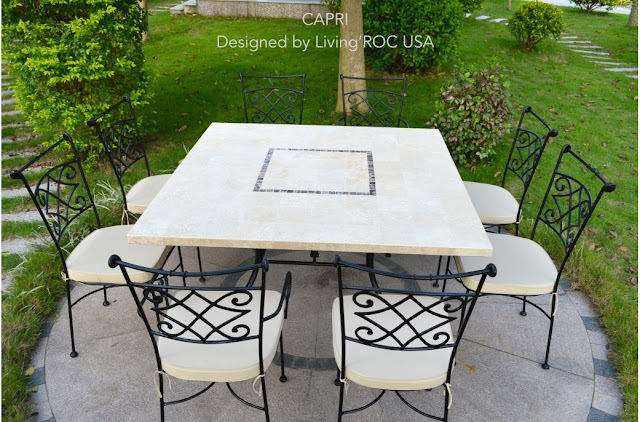 Please visit our whole selection of some of the most finest patio tables on LivingRoc. thank you very much for sharing with us such a nice information,keep updating us with some new posts.